On Fair Isle, the 10th-largest of Shetland’s 15 inhabited islands, the locals don’t permit themselves to gloat even when occasion gives them reason to. So, this weekend, there may simply be a quiet nod here and there and some little tugs of acknowledgement that might say “well done”. But there is no doubt that the island, home to fewer than 60 souls, has just scored a remarkable victory, and one that may yet have huge and beneficial consequences. Last week Mati Ventrillon, a craft textile designer who has lived and worked on Fair Isle with her young family for eight years, forced an apology from Chanel after she discovered that the French couture giant had used some of her unique Fair Isle knitwear designs in its recent Metiers d’Art show in Rome. She immediately took to social media to air her grievance, asking if this was “endorsement or plagiarism?”. Chanel acknowledged that it had erred and issued a full apology, crediting the designs as the creation of Fair Isle textiles specialists. What chance did a French fashion house have when pitted against several centuries of Scottish heritage and tradition on an island whose very name signifies the highest quality of designer knitwear? Ventrillon, it seems, is now happy to let the matter rest, but she also believes the incident has turned a welcome spotlight on the ways of a world far removed from the high-octane rhythms of French fashion. A genuine patterned Fair Isle jumper is considered an authentic work of art. These garments will take, on average, more than 100 hours each to hand-knit – and that’s before you factor in the time spent on designing them. This is an intricate and highly skilled process, involving arranging the traditional patterns and the five colours that typically characterise these threads. Wool and knitted textiles are enjoying something of a renaissance in the world of high fashion. Perhaps that’s what led Karl Lagerfeld’s Chanel researchers to this tiny hothouse of textile creativity in the first place. But while wool and garments made from it have been a staple on Fair Isle for generations, a group of edgy knitwear companies in London – with names such as Unmade and Wool and the Gang – are turning the traditional model of purchasing fashion products on its head. 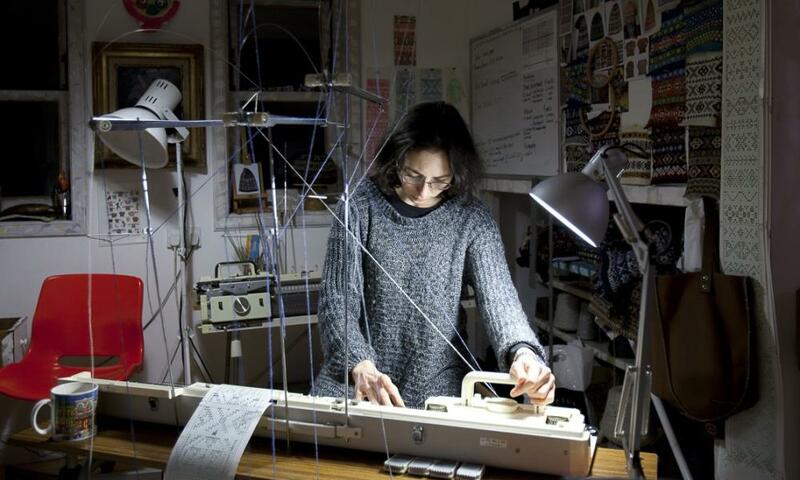 Using computer programming, online technology and the power of crowdfunding, these cutting-edge collectives are using wool – that most traditional of yarns, often associated with dozing grandmothers in rocking chairs – to challenge the accepted economic rules of fashion retailing. Ben Alun-Jones, one of the co-founders of Unmade, reflected last month on estimates that 10% of all the clothes being made in the world go straight to landfill, which is, he says insane. “We seem to have lost something in mass production, where you are making things for everyone, but everything is made for no one,” he said. Wool and the Gang, meanwhile, has a global battalion of 3,000, mainly female, casual knitters, who use the company as an agency to supplement their incomes. On Fair Isle, Ventrillon sustains a lifestyle that marries the wisdom and craftsmanship of the ages with online technology. “I have a waiting list of online orders that is 18 months long, and so I have had to close it,” she said. “My customers interact with me at every stage of the creation, right through to the design. They know that they are getting a genuine garment made entirely on Fair Isle, in a process that uses our unique patterns and techniques but allows them to play a part in the crafting. Elizabeth Riddiford of Exclusively Fair Isle is one of three commercial hand-knitters on the island. “I have been a Fair Isle hand-knitter and hand-spinner since moving here more than 30 years ago. “I learned the intricate patterns and techniques of real Fair Isle knitting from experienced local Fair Islanders who were all born on the island in the early 1900s and who, along with their sisters and cousins, had been taught to hand-knit by their mothers and grandmothers from when they were toddlers,” she said. Earlier on Friday, Ventrillon had other duties to attend to. Another thing that knits this tiny population together is its community spirit. So she has trained as a firefighter and forms part of the team that daily attends to the island’s airport.